In the previous post on tangent theorem, we have learned that if a line is perpendicular to a radius of a circle at a point on the circle, then the line is tangent to the circle. In this post, we prove the converse of this statement. We prove that if a line is tangent to a circle, then it is perpendicular to the radius at the point of tangency. 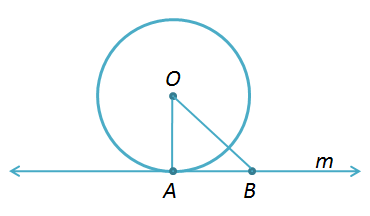 Note that the point of tangency is the point where the circle and the line intersect. We will use proof by contradiction to prove the statement above. Let us assume the opposite of the conclusion. That is, assume that line m is not perpendicular to OA. Then, there exists a segment OB which is perpendicular to OA. If so, OB < OA (Why?). But OB lies exterior to the circle since m is a tangent line. This means that OB > OA. The statement OB < OA and OB > OA are contradictory. Therefore, the supposition is false. So, m is perpendicular to OA.